I swoon at a good love poem. Here’s a quick introduction to two that have me dizzy on my feet. Vona Groarke Photograph: Ed Swinden/The Gallery Press. 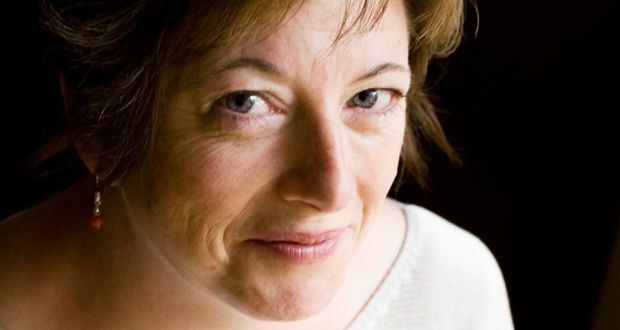 Both are by Vona Groarke, HoCoPoLitSo’s guest for this year’s evening of Irish writing and music – it’s this Friday, don’t just mark your calendar, get your ticket. I offer these poems here as foreshadowing for the event, a beloved favorite annual occurrence that’s been going on for more than forty years now. Both poems I discovered while reading up in advance of her visit. Each has me in its own way a little breathless, smitten, staring newly in love at their marvel. “Shale” is just a great little love poem, I think. It left me trembling. Read the the length of the poem here, it’s not long, but I am only sharing a few stanzas in this piece. It starts and ends by a ‘not telling’ device, meanders nicely in-between, but what it ends up saying along the way. our hands, and our lost house. I described it to a friend as perhaps opaque while trying to be translucent, but opalescent all the while. It’s that opalescent surface that’s dazzling and intriguing, then you peer through the shimmer into what the poem’s lovers share as example of us all. There’s the narrator relating a contemplative monologue, a scenario that is part plot, part seeming. I am not sure what is actually moment and what is shared mind, but it doesn’t matter, the poem’s lovers seem to find themselves at that point of realization and action that comes when two bodies/souls make that moment out of circumstance and each other that is a fusing. And that ending, wow, an unsayable understanding just left there. You know what I’m saying? The sea is breaking and unbreaking on the pier. my moon-eyed, dark-eyed, fire-eyed lover. that has grown warm between us. That warming of such a tangible object is quite a making. What a poem. I’ll go back and read it again and again, wanting that answer, finding that stone. An aubade is a first-thing-in-the-morning poem lovers share to each other. Think of the nightingale and the lark in Romeo and Juliet. In that case, the debate was about which bird’s song was determining the moment over, the day begun, and the time together over, or not, one being the voice of morning, the other of night. A clever quartet for the two still in bed. The poem “Aubade” from Spindthrift takes on a different sort of in-between-lovers morning scenario. As readers, we are on the sickbed where the caretaker of the couple narrates understanding and affection while tending the beloved. It is hardly a place for a love poem, one would think, but oh how it is. The poem is pictured here in its entirety, so have read. It’s a way more transparent read that the previous piece, but you do gain a sense of Ms. Groarke’s way of presenting the world through her observations and language. Transparent, but the glass is beautifully etched with fern and foam. Let the worst I ever do to you be die. Such a sober realization of the inevitable, that we will die on those we love and that is quite a thing should we be the first to go. There’s a dearness and commitment in that line that is quite a realization. Ideally, it is the worst we’ll do. Is love ever ideal? And then that last, true-love line, pure presence, able and ideal, and love in action. I am here, blessed, capable of more. Beautiful. Love poems aren’t just for the young, the beautiful, the wooing. They are for the lifelong and every moment. It’s time for you to fall in love… with Irish Evening. Mentioned above, Vona Groarke will be reading from her work followed by a concert of Irish music and championship step-dancing at HoCoPoLitSo’s 41st Irish Evening on Friday, February 8, 2019 at Smith Theatre in the Horowitz Center for Visual Performing Arts on the campus of Howard Community College in Columbia, Maryland. For this year’s Irish Evening, music will be performed by The Hedge Band, featuring Laura Byrne on flute, NEA National Heritage Fellowship winner Billy McComiskey on box accordion, Donna Long on piano, and Jim Eagan on fiddle. Traditional Irish Dancing will be performed by Teelin Irish Dance, featuring owner and director Maureen Berry and the 2016 World Champion Saoirse DeBoy. It’s going to be a special evening. You are going to fall in love with Irish Evening. The program begins at 7:30 p.m. Click here for tickets.